How was everyone’s first week back at school? Do the kiddos like their teachers? Are they getting back into the routine? Mine seem eerily happy. Don’t get me wrong, there was some grumbling when they had to get up early and put on their uniforms but that’s about all the grumbling I’ve heard. They actually seem happy to be back at school, even if they won’t admit it. Woo hoo! On the other hand, my daughter spent 2 1/2 hours doing her homework the other night. Is that really necessary? I can’t seem to commit to summer or fall around here. I’m teetering between the two seasons because I just don’t want to give up summer. So, you will still find a few remaining summer recipes like this Late Summer Quinoa Grain Bowl, but I will continue to intersperse with some Sheet Pan Brown Sugar Pork Chops until I’m fully committed to fall. I could eat salads like this every day of my life. I’m in love with them and have a lot here on Seasonal Cravings. Sorry for that, but quinoa is the best. Guess I could never be Paleo! 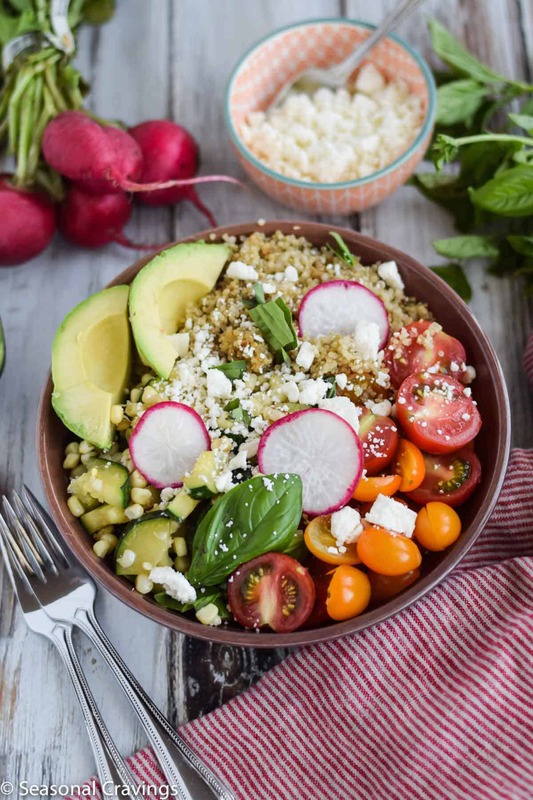 This Late Summer Quinoa Grain Bowl is full of zucchini, fresh corn, tomatoes, and feta for a salty kick. Trust me, once you make this baby, you will crave it all the time. It keeps well in the refrigerator for a few days without the avocado. I didn’t put any dressing on mine because I didn’t think it needed it. Add a drizzle of fresh lemon and a bit of olive oil if you prefer. Heat a skillet over medium-high heat and add 1 tbsp olive oil. Add diced zucchini and corn, salt and pepper to taste and saute for about 5-8 minutes or until you see some browning. 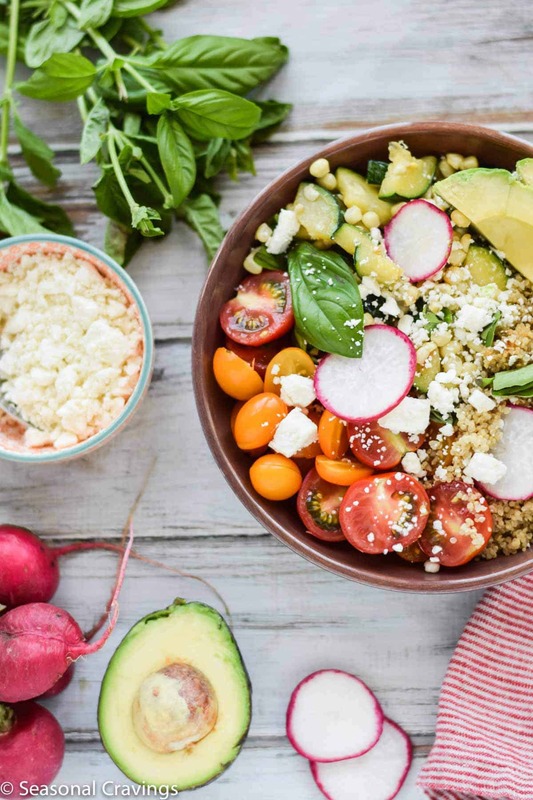 Assemble salad in a serving bowl. Add all ingredients and toss. I did not use any dressing but drizzle with fresh lemon and a bit of olive oil if you prefer. Check out my salad index here. I’m totally loving this bowl Karen! So fresh and delicious! 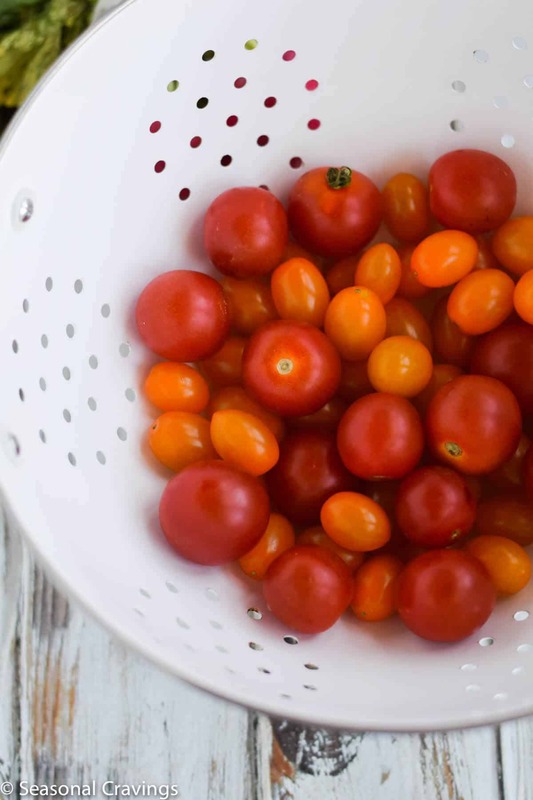 Perfect for all those fresh veggies that are still available. i love that i can make a double batch of this and grab it for a lunch or dinner on the go. so fresh and delicious!! This looks like the perfect dish 🙂 My meals have been staying summer-y, but my baking has taken a turn towards fall. This is a great transitional bowl! I have quite a while before my little one has to go to school and I’m already dreading it! 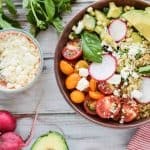 These quinoa bowls look amazing and like just what I want to eat for lunch everyday! Wow this looks so delicious! I’ve been adding radishes to everything lately … i love the vibrant pink colour they give to a dish!